With Kristina Halvorson’s Master Class coming up soon (in just 8 little days ;-), I’ve been looking for interesting examples of content strategy at work in higher education. After the UB School of Medicine featured last week, let’s look this week at how web content strategy helped Ithaca College rethink and revamp its Financial Aid & Billing website. About 3 years ago at Ithaca College, the Office of Financial Aid merged with the Office of the Bursar to form a new Office for Student Financial Services. Each office had a website of its own managed by different people using different content management systems. Some minimal attempts to rebrand and crosslink the two websites had been made, but the core content on each website hadn’t been touched. As a result, there were tons of persistent redundancies, and the quality and usability of the content suffered over this three year period. Bonny was kind enough to answer the following questions so we can all learn from this project. 1) How did you develop the content strategy for this site? Our primary goals were to streamline and improve the usability of the content and enhance the service we were providing to prospective students, current students, and parents. We also wanted to improve the site’s usability and minimize the maintenance headaches for our staff. Our first step was to conduct a thorough content audit of these sites and all other financial aid related content within the Ithaca.edu structure. Once we knew what we had, what we didn’t, and where it lived within our site structure, we spent significant effort doing focus groups, interviews, and usability testing with key audiences (including internal staff). This helped us identify what content was working and what wasn’t. We found lots of issues, ranging from confusing transaction processes to outdated third-party content to inconsistencies in language that were tripping up our users. Once we were clear about the problems, we worked with our partner to develop a new content strategy for the site. Working with wireframes as a guide, we restructured and rewrote everything from the ground up, reducing the number of content pages to about 1/3 of what we previously had. When doing the rewrite we put a huge emphasis on making the site more conversational and friendly, and minimizing transaction hassles by developing tutorials and other support systems. I would need to confirm the specific figures with my colleagues in financial aid, but I know that once the site was launched, it immediately slashed the volume of calls they were receiving from frustrated families trying to pay their bills with us. The staff finds the site infinitely easier to use when servicing the calls they do receive, and we’ve had nothing but compliments from other users. We will be conducting follow-up testing on the site soon to better measure the success of this relaunch. 2) Have you set up some processes to manage the content on this site now that it’s launched? Any good tips you can share with the class? We have identified key members of the staff who are content experts and who will be involved in the maintenance of the site, but since we recently hired a new Director of Financial Aid and she has not started yet, we have waited to make major decisions about ongoing responsibilities until she arrives. Going forward, someone from my office will always retain strategic oversight for the site due to its recruitment value. I will collaborate with the new director and her staff, as needed, in developing key messaging for the site and I will advise on content development and management. 3) Content Strategy looks like a daunting tasks, any lessons learned? This was the most comprehensive web relaunch I have ever done, but the design was never a focus of our conversations. We didn’t even consider what the site might look like until very late in the game. The content is the star, not the design, and the site is stronger for it. A thorough content audit (NDRL: as adivised in Kristina Halvorson’s book) is well worth the time it takes. Don’t limit yourself to the site itself, either. Your users are finding the site through a variety of different doors. Be sure to use Google and your site search to pinpoint other entry points and identify any opportunities to improve the experience, make your language consistent, or reduce user confusion. Here’s the best part: approaching a project like this from a content strategy standpoint is a golden opportunity to focus your messages, sweep out the cobwebs and lower your content maintenance burden. Inside Higher Ed recently reported on “The New Financial Aid Information Gap” ( http://bit.ly/f1bHeG ) based on a recent study by the College Board showing that many families have difficulty understanding college costs and financial aid. Take a look at just about any college’s financial aid and billing sites and you’ll see that they don’t help matters much. 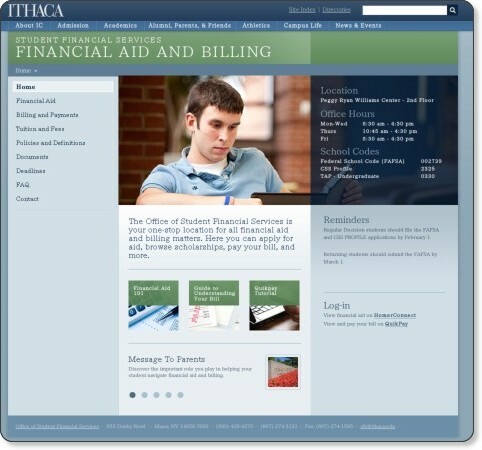 I had the privilege of partnering with the Ithaca team on this project, which I have to say is the first time I’ve ever seen a college invest significant time and resources on their financial aid and billing sites. This is clearly mission-critical, especially for a private college with a significant sticker price. I do have one thing to add to the case study that was particularly valuable to me as a content strategist. In addition to the interviews, focus groups and usability studies Bonny mentioned, we had an opportunity to participate in a Saturday admissions open house session called Financial Aid 101. There the former director of financial aid did a fantastic job explaining the financial aid process in concise, simple terms that all of the families in attendance could understand. His presentation, along with the questions from parents in the audience, really set the framework for the new site IA and tone of the content. Thanks for sharing the link to the article and the extra tip (re: considering all the content even presentations made at open houses), Todd!